Shelly Alon just released his latest hacker-themed shoot 'em up game to the Play Store and it looks just awesome. 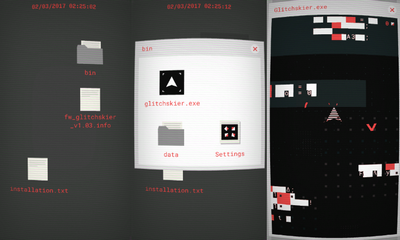 Glitchskier is a game where players hack the computer to progress through the randomly-generated levels, shooting enemies, fighting epic bosses, and trying to beat the system itself. The gameplay is pretty challenging. You play as a sort of a ship, destroying all kinds of enemies in your way, and avoiding crashing into them. You collect weapons for unlimited ammo, and you can also unlock an endless mode to keep on shooting. Glitchskier features a playfield made up of glitchy pixels and ASCII characters with distortion and static effects. That gives the game its charm immersing you into a hacker-like experience. It's a game within a game! If you like the game as I do, follow the Play Store link above the video to purchase it and support the devs.